Make everything from one pattern ? Interested in the challenge of making everything from one pattern ? And I don’t mean a wardrobe pattern ! The Pattern Review One Pattern Many Looks contest for 2016 is currently running. For this contest, you have to choose one view of a pattern. They only allow you to make changes in fabrics and trims. They specifically exclude doing any pattern work, apart from fitting. Personally I find it more fun to do some simple pattern work. I know many people don’t want to change patterns, but the alterations suggested in this post are simple. Several years ago I wrote a post on using one pattern for a dress, top, jacket, vest, coat. The pattern I used is now out of print. This time I’m starting from Simplicity 8060, a Mimi G jumpsuit pattern. There’s a link to a sewing video on that page. If a shirt isn’t your style, you could do these simple pattern alterations starting from many other jumpsuit patterns with sleeves and waist seam. I’ve collected some of the current ones on this pinterest board. 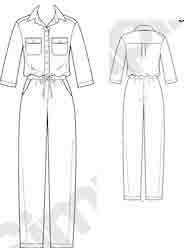 Or of course you could instead work the other way round, and use your favourite top and pants patterns to make a jumpsuit. Make the length of the top pattern at your personal bodice length (nape of neck to waist) plus 1-2” / 3-5cm, to allow for movement. If you’d like a tutorial, here’s a video from Wonder How To. Most of these pattern altering ideas don’t just apply to one pattern. They’re general pattern altering skills which can be applied to many other patterns as well. I’ve begun a pinterest board of some patterns that are easy to change. Use top and bottom patterns separately. Use a larger size of the top for a bomber / blouson jacket. Use the casing and drawstring for the waist. Make a dress with a waist seam, by adding a gathered rectangle of fabric below the waist instead of the pants. Any length from mini to maxi. How about using some special occasion fabric ? Several examples of commercial patterns which do that on this pinterest board. Use the pants pattern pieces to make gathered waist pants. – change the shape of the collar : round the corners, or use only the band. These changes can be made direct with the pattern tissue if you want to. Or for more speed there are even easier methods. Change hem and sleeve lengths – see instructions for lengthening and shortening the pattern tissue, given on most pattern sheets including this one. If you’d like more detailed advice, there are detailed examples of lengthening and shortening in this post from Tilly and the Buttons. shirt / tunic / shift shirt dress without waist seam. Use a size larger for a shirt-jacket, longer for a duster. Lengthen or shorten the sleeves. Omit collar / cuffs / sleeves. Make sleeveless tops, vests and sleeveless coats. Add a bias binding or bias facing to the remaining edge. Or make a facing pattern, see about 3/4 of the way down this post. Shorten the length of the jumpsuit pants to make a romper. Shorten the pants used without the top, to cropped, capris, bermudas, shorts. For speed shortening, just fold back the unwanted part of the tissue when cutting. Though remember to allow for the ‘turn of the cloth’ at the hem (see angle at hem of pants pattern below for an example). For these changes, it’s best to trace the pattern and work with the tracing. Here’s a post on changing necklines. Close front of top to make a pullover top, perhaps with a variety of half plackets (henley, polo, zip). Extend that to a shift dress. Here’s a post on closing the front of a pattern. To make a skirt from the pants pattern – lengthen downwards from the vertical part of the crotch seam. I’ve extended the stitching lines in this diagram, as I tend to make my own patterns without seam allowances. You can of course extend the cutting lines. Remember to add hem allowance. On that image I took it easy and used straight lines. But hem and side seam need to meet at a right angle so the hem is a smooth line. 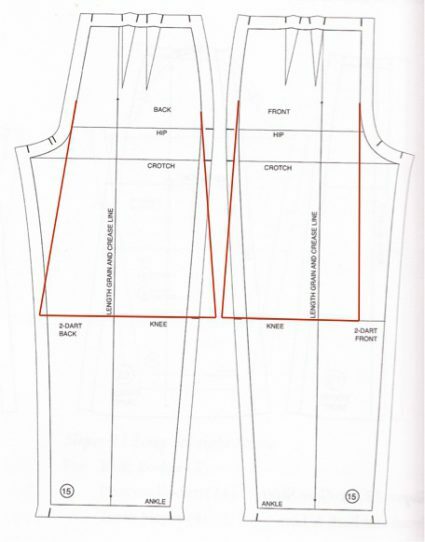 So if your pattern piece has sloping sides, you need to curve the hem shape. Find a line at right angles to the sloping side that meets the hem about 1/3 the way along, then smooth the wide angled join into a curve. See this Threads magazine download book on drafting and sewing your own lining patterns. This post focusses on all the things you can do to make different garments from one particular pattern. This post used to end with a section listing some other sources which show how easy it can be to alter a pattern. That section has expanded so much, I’ve now made it a separate post on Simple pattern alterations.